Combine coupons with store sales to save a bundle on your next shopping trip. t You want to save money, but aren’t a crazy coupon lady? Follow these steps to help you get organized and save time (and time is money!). These steps progress from easy to more time consuming, but all will save you money. t On Sundays, I get all my drugstore and grocery store ads together. They usually have the same items on sale, so you just have to take note of the differences. One might have shampoo on sale for two for $4. Another might have the same deal but offer $1 reward. Go with the rewards so you can use it on another purchase. t Eventually you will learn the pattern for sale timing and can hold off on certain purchases. For example, vitamin brands usually rotate as to which brand is buy one, get one free (BOGO). So sometimes you just have to wait a while to get what you need and save a little money. t Even if you just shop the sales without using a single coupon, you will still come out ahead. t Many couponers clip every coupon and try to rationalize a purchase just because it is almost free. Start by just clipping the coupons you are going to use. If you don’t currently eat waffles or a certain brand of yogurt, don’t force yourself to buy them just because you have a coupon. You might end up spending more instead. t “Stacking” is what couponers call using more than one coupon for one product. It works like this: You have a sale item, an in-store coupon and a manufacturer’s coupon for the same item. If your store allows it, you can use them together for even greater savings. t You are essentially stacking them on top of each other to get the best deal. Here is an example I have from last week: Toilet paper was on sale for $6, in the circular there was an in-store coupon for $1 off and on the actual package of toilet paper there was a 50 cent manufacturer’s coupon — so the 12-pack of toilet paper cost only $4.50. It’s even more exciting when the store doubles manufacturer’s coupons! t One of my friends is a true coupon lady and saves thousands a year from it, but she puts those savings into a college fund for her daughter. That means she pays full price at the time of purchase but is building up a nice savings fund with the discounts instead. 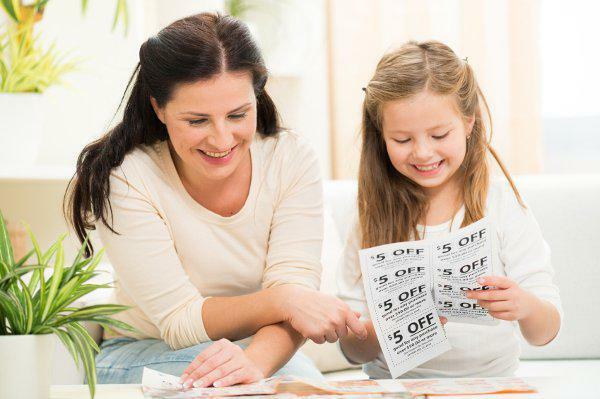 t Please check your store’s coupon policy as some may not double coupons, some may not accept stacking coupons on one item and some may even offer triple coupons a few times a year.